Born out of compelling community need in 1967, Boca Raton Regional Hospital is a not-for-profit, advanced tertiary medical center with 400 beds and more than 800 primary and specialty physicians on staff. The Hospital is a recognized leader in Cardiovascular Care, Oncology, Women’s Health, Orthopedics, Emergency Medicine and the Neurosciences, all of which offer state-of-the-art diagnostic and imaging capabilities. Boca Raton Regional Hospital is accredited by The Joint Commission and is one of only four hospitals in Palm Beach County to be designated by the Florida Agency for Healthcare Administration (AHCA) as a Comprehensive Stroke Center. To be the preeminent regional leader in healthcare delivery and the hospital of choice for patients, physicians, employees and volunteers. In 1962, Gloria and Robert Drummond’s children, Debbie and James Randall, were tragically poisoned and died before reaching medical attention 30 minutes away. The small community rallied to build a hospital “of its own” to ensure that area residents would have access to quality healthcare and life-saving emergency care when they needed it the most. Eighteen passionate and dedicated women joined with Gloria, who led the effort to raise funds, and formed the Debbie-Rand Memorial Service League. From bake sales and fiestas to a black-tie Ball, the community raised the funds to build a Hospital that would develop into a nationally ranked medical center. Boca Raton Regional Hospital is an advanced, tertiary medical center with 400 beds and more than 800 primary and specialty physicians on staff. In the last 50 years, Boca Raton Regional Hospital has evolved from a capable community hospital into one of the preeminent medical centers in Florida. The Hospital is a recognized leader in Cardiovascular Care, Oncology, Women’s Health, Orthopedics, Emergency Medicine and the Neurosciences, all of which offer state-of-the-art diagnostic and imaging capabilities. The Hospital is a designated Comprehensive Stroke Center by the Florida Agency for Health Care Administration (AHCA). Boca Raton Regional Hospital was recognized in U.S. News & World Report’s 2018 - 2019 Best Hospitals listing as a Top Ranked Regional Hospital in the South Florida metropolitan area and the highest ranked hospital in Palm Beach County. For the second year in a row, Boca Regional earned the 2016/2017 Consumer Choice Award by National Research Corporation (NRC). 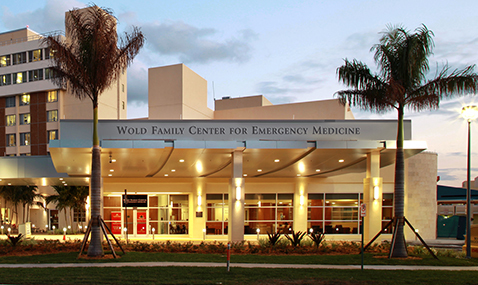 Boca Regional was the only hospital in Palm Beach County to earn such a distinction. Boca Raton Regional Hospital was also the recipient of the 2014 Distinguished Hospital Award for Clinical Excellence™ for 10 years running and was named one of Americas 50 Best Hospitals in 2011, 2012, 2013 and 2014, both by Healthgrades®. The Hospital’s Christine E. Lynn Heart & Vascular Institute has been named twice as one of the Top Hospitals with Great Cardiovascular Programs by Becker’s Hospital Review. In 2013, the publication also recognized the Eugene M. & Christine E. Lynn Cancer Institute as one of the 100 Hospitals and Health Systems with Great Oncology Programs. Home to the Lynn Cancer Institute, the Harvey & Phyllis Sandler Pavilion opened in November 2008 and is one of the largest cancer programs in the state of Florida. The award-winning $73 million, 98,000 square-foot facility houses the Hospital’s imaging, radiation, chemotherapy, cancer support services and clinical research, as well as the Morgan Pressel Center for Genetics. The Hospital’s Christine E. Lynn Women’s Health & Wellness Institute provides women in South Florida with a continuum of care that addresses a woman’s unique medical needs. The strikingly beautiful, 46,000 square-foot facility offers the expertise of renowned clinicians, the most advanced imaging technology in the region and a myriad of holistic and educational programs, as well as support groups. In 2012, Boca Regional received a $25 million grant – then the largest, single philanthropic gift in the institution’s history – from the Marcus Foundation to create the Marcus Neuroscience Institute on the Hospital’s main campus. The facility opened in January 2015 and serves as a new, state-of-the-art nexus of care for neurologic and neurosurgical patients and has transformed the landscape of clinical capabilities available in the region. The Hospital has been designated as the primary teaching site for Florida Atlantic University’s Charles E. Schmidt College of Medicine Internal Medicine and General Surgery Residency Programs. Boca Regional is also the official Sports Medicine provider for Florida Atlantic University and Lynn University athletics. We invite you to learn more about us. You’ll find renowned physician expertise. The most sophisticated technology available. Superior nursing care. You’ll find Boca Raton Regional Hospital…advancing the boundaries of medicine.